We took Maya on a 3-day road trip earlier this week. As I was preparing for the trip, I looked into various options for her meals on the road. It'd be too troublesome to bring what she eats at home or some premade frozen raw, so I decided to go with freeze-dried raw instead. I planned to get the Honest Kitchen's meals in their trial size packages, but unfortunately both stores I went to only have the 4 lb boxes, which is a bit too much given that we will only be traveling for 3 days. 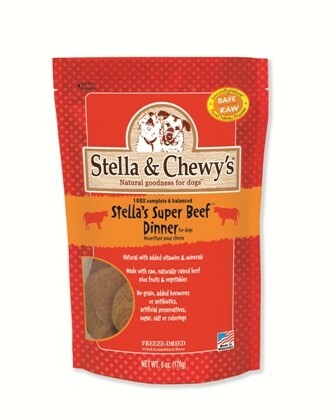 So I ended up only getting some THK samples and bought a bag of "Stella's Super Beef Freeze-Dried Dinner". Will I recommend it to others? Yes. If price isn't an issue, it's excellent for those who don't have access to a freezer but wants to feed raw. Will I buy it again? Maybe. I may get it if I go on another short trip or need to board Maya for just a few days. However, for longer trips/stays, I might go with the Honest Kitchen instead to save a bit on costs.